We specialize for exclusive, large-scale parties organized by event and wedding organizers such as luxury weddings, corporate and VIP celebrations, private events. We are the first business in Hungary that combines the experience of a truly mesmerizing cake with an unforgettable lighting performance. The result will leave your audience speechless! We create a Memory for Life at an already special occasion. CakeUp projections customer-specific service provides double values at the same time: the package includes our secret-recipe multi-tiered delicious cake which becomes truly mesmerising by our projection mapping. Our passion is producing truly bespoke, tailor made, stylish projections that represent the collective creativity of our 3D artists. We create exclusive and captivating experiences for your special occasion. Cake mapping is a creative, new design tool that has the ability to take people on a journey and at the same time deliver the intended message. We liven up any event by creating an experience tailored to a specific atmosphere and concept. Our goal is to mesmerize your guests by combining a quality and elegant visual show with a delicious cake. 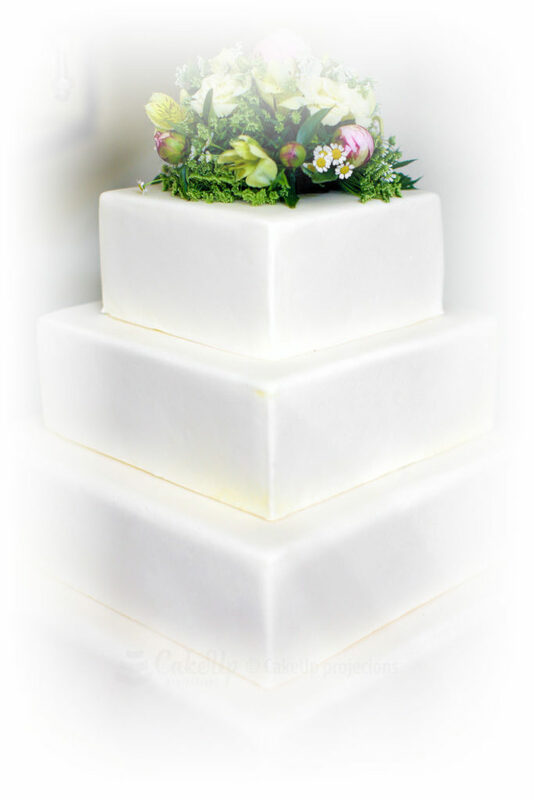 Cake mapping is a unique addition to an intimate wedding or a premier event. We can make any vision come to life, our creativity is limited by the project’s budget. This highly creative technique allows the projecting of high quality video images onto the cake that will enthral your guests. The wedding cake is probably the most delicious confection you’ll ever eat – so why not turn it into a living piece of art? It is the centrepiece of your special day and should be a unique reflection of the happy couple’s personal taste and style. We offer perfect, unforgettable experiences. Projection mapping technology is a dramatic visual experience that allows us to animate your cake, creating amazing visual illusions by abstract colours, patterns, designs like a true fairy-tale. Photos of the bride and groom and creative messaging from well-wishers can be projected right onto the cake. Our festive cake is a limited-edition goodie. CakeUp is not only a workshop of animation, but an artisan confectionery at the same time. That makes it so distinctive. We created our own unique cake specialities which are world-class sweetness of CakeUp Projections and one of the pillars of our combined services. The CakeUp cake speciality is not available in the patisseries, they only comes with the CakeUp combo-service package. Season-by-season we serve double options for our beloved partners. CakeUp projections brings together 3D projection mapping technology and a secret-recipe, world-class special cake. Our goal is to give you an unforgettable visual and gastronomic experience at weddings, celebrations and corporate events. Our projections are customized to our customer’s needs. The top tiers of the composition are made of real cake; the number of tiers depend on the number of guests to be served. The bottom tiers are dummy ones; they are not edible. CakeUp projections uses a square-based, six-tiered cake covered with white fondant icing and we project onto the sides. What’s underneath is our unique CakeUp Cake waiting to be tasted. Nothing is impossible. We work with wedding planners, agencies, venues or direct customers to create inspirational, unforgettable, innovative, and sensational performances. We want to tell stories that mesmerize the audience. We want to create magic and fantasy capturing the atmosphere of the space of the event. Each project begins with production meetings to brainstorm and finalize ideas. We want to create an unforgettable show that will leave your audience speechless. Our services are absolutely customized to our customer’s vision. The number one goal of our professional team is to create the most amazing experience for your guests at your wedding or any other celebration. We create art scenes and 3D effects that generate an astounding effect on cakes, floors, walls and buildings. Our 3D mapping service can surprise your guests; it is a unique experience. We create customized and stylish productions for events like Wedding, Anniversary, Birthday, Graduation, Bar Mitzvah, Christening, Premieres & Wrap Parties, Galas, Art Openings, Awards, Fashion Shows, Corporate Launches, Grand Openings, and VIP parties. An example of the mapping service: at a white arched wedding chapel images such as sunlight on water and mountains with green forests are projected/mapped onto walls and windows during the ceremony, which makes the ceremony even more special. A two-minute projection that incorporates real scenery and computer graphics is displayed on columns, beams and other objects, making guests feel they are actually in a fairy-tale. The mapping starts shortly before the bride and groom enter the chapel. today and see how CakeUp projections can elevate your event!